I suspect the sight of a Santa Fe passenger train passing through Southern California’s Cajon Pass might have been a non-event for railfans in the 1950’s. 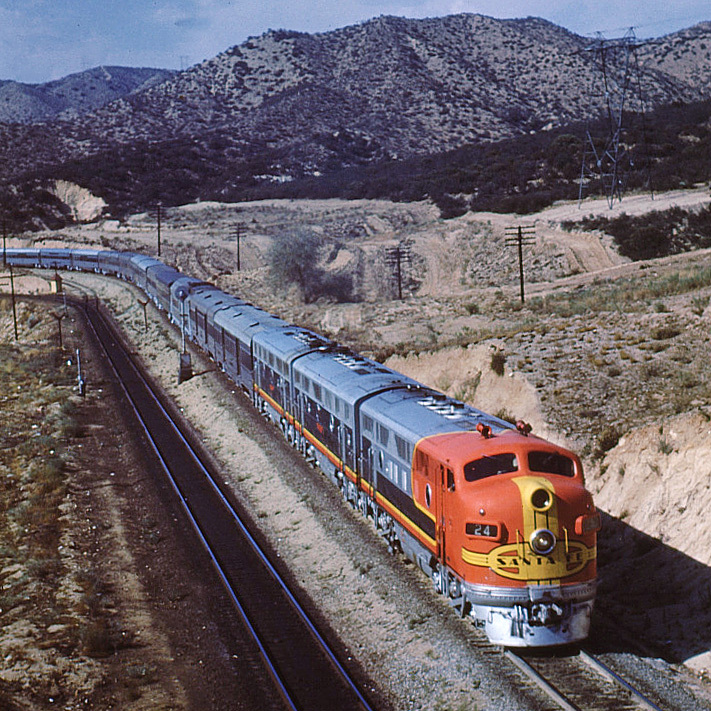 With The Super Chief, The California Limited, The Chief, El Capitan, and lowly train 23/24 serving the Chicago-Los Angeles traveler, 10 Santa Fe streamliners every day was today’s equivalent of orange GE’s on a BNSF train-nothing worth writing home about. 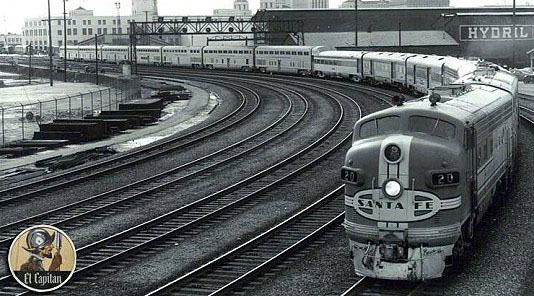 Fortunately, some photographers took the time to document what was a very common occurrence, allowing us a momentary glimpse back into the glory days of U.S. passenger trains. The slide had no information on it. It’s obviously on Cajon Pass. A bit of sleuthing allowed me to fill in some details. I recognize the location. It’s where the North track and South track converge just east of Summit, with the train heading east. The direction and angle of the sun tell me it’s late afternoon sometime between September to March. The only eastbound train over Cajon Pass at this time of day would be El Capitan. It departed San Bernardino at 3:07 PM, placing it at Summit around 3:45 PM, give or take. What year was the photo taken? The lead unit, 24L, was built in April, 1948. The power looks good, but it’s not brand new. My guess is it’s a couple of years old, placing the year about 1950 – 1952. As the train is made up with standard Budd passenger cars, the above image must be before 1956, as that’s when the Santa Fe took delivery of its iconic hi-level passenger equipment. Compare its profile to that of the hi-level equipped El Capitan below. Click here for more information about the hi-level equipped El Capitan. The photographer? No name is on the slide, but I, for one, owe him a debt of gratitude for taking the time and effort to capture the moment in time when just another Santa Fe passenger train went by. Is there a moral to the story? Of course there is. What’s here today is gone tomorrow. The days of boring SD40-2’s on every UP train are long gone. Today’s boring orange GE’s on the BNSF will be gone, sooner that we think. Photograph today’s rail scene. It’s the only one we have. Stephen Stills said it best: Love the One You’re With.